Every now and again a little impulse addition to the shopping trolly works out a tasty dream! 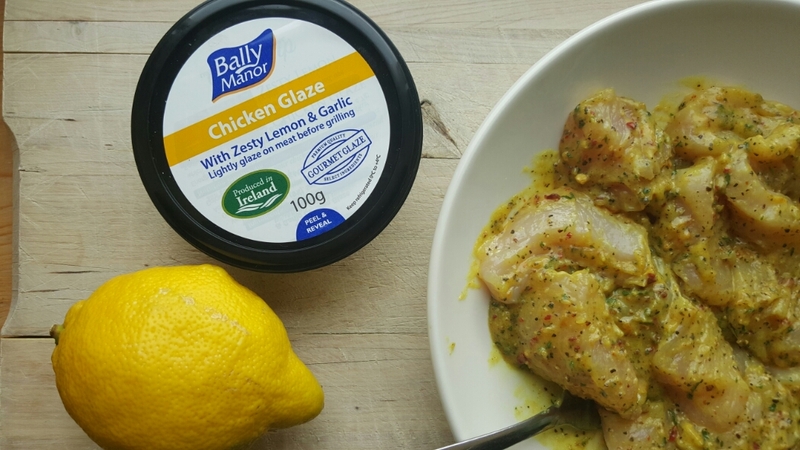 I threw in a tub of Lidl’s Bally Manor Zesty Lemon and Garlic glaze for chicken with last week’s groceries. It’s intended to be brushed onto the meat before grilling but today I used it as a marinade and cooked the chicken pieces in my Tefal Actifry for 15 minutes. I threw together what I call the Whatever I Find Salad salad selection, basically whatever is in the fridge and fresh! (Often changed into the Whatever I Find mixed omelette depending on how productive our chickens have been!). Today’s salad was mixed rocket and spinach leaves, crumbled feta cheese, a hand full of chopped cherry tomatoes, fresh pasta, sliced avocado and a few juicy olives all topped off with our Zeaty Lemon and Garlic Chicken. Super tasty, really filling and clean plates all around!